Victòria Fiol – Master in Landscape Architecture Barcelona – Universitat Politècnica de Catalunya – 35ª EDITION. 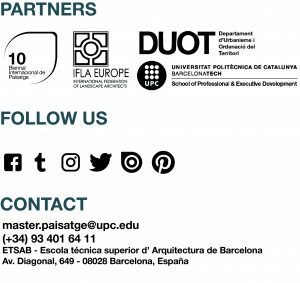 Architect by the UPC, PhD candidate in the Department of Urban Planning and Territorial Planning of the ETSAB. She has collaborated in the Master’s Degree in Landscape Architecture and the Master’s Degree in Landscape Architecture at the UPC from 2009 to the present, and as the Coordinator of the module on Landscape Interventions in Urban and Tourism Areas of the Master’s Degree in Landscape and Restoration of the University of Illes Balears. He collaborated in the Department of Town Planning and Territorial Planning of the ETSAB in different projects. Later he worked in the Department of Public Space of the AMB, carrying out projects at both territorial and public space. Currently, he continues his professional practice at his office Victoria Fiol Arquitectes, developing projects in the disciplines of architecture, urbanism and landscape.